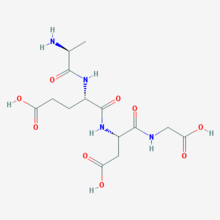 Epitalon is a synthetic peptide made of four amino acids (alanine, glutamic acid, aspartic acid, and glycine),in additon,that is based on a natural peptide called Epithalamin extracted from the pineal gland.Vladimir Khavinson synthesized it ,a Russian professor and gerontologist, whose research focused on the development of peptide preparations used to restore function in various organs in order to prevent and reverse the aging process. Epithalon (also known as Epitalon or Epithalone) is a peptide used to regulate the cell cycle through up-regulation of telomerase activity. The sequence of amino acids in the peptide is Alanine-Glutamate-Asparagine-Glycine. Animal studies have been done on the effects of Epithalon on suppression of spontaneous mammary tumors and spontaneous carcinogenesis. Studies have shown that the mode of action of Epithalon involves suppression of oncogene expression and modification of telomerase activity. When the peptide was administered to fruit flies during the larval stage, it was shown to increase the average lifespan by 11-16 percent. In a study on rats exposed to equal amounts of light and darkness, varying amounts of light and darkness, or permanent light illumination,therefore Epitalon increased maximal lifespan in all three groups by 68 days, 95 days, and 24 days, respectively, in comparison to controls. In mice of model of hypertension, injections of Epitalon did not affect average life span of the mice, but did increase the maximal lifespan by 12.3%. Research showed there was a decrease in pancreatic enzymes to occur in elderly individuals. In both young and old rats,Epitalon increased the activity of enzymes that digest protein and sugar, with the effect more pronounced in the older rats. Another study found that the peptide increased enzyme activity in the small intestine of aged rats. When scients gave Epitalon to rats with colon cancer, Epitalon increased lymph flow (containing white blood cells) and apoptosis (programmed cell death), and slowed cancer growth. In mice with mammary tumors, Epitalon significantly decreased the number of mice with multiple tumors and decreased the maximum size of tumors in comparison to control mice.The researchers also found that the peptide reduced the expression of certain genes that, when over-expressed, play a key role in the development of breast cancer in both mice and humans. For instance,another study in mice found that treatment with Epitalon reduced the number of mice with malignant tumors(cancerous tumors) and prevented the cancer from metastasizing (moving to another location in the body) in all of the treated rats.In contrast, 3 out of the 9 mice that did not receive treatment with Epitalon saw metastases.